Hopefully these 4 highways will be put into TM someday. Make the files and they will be. I've deliberately ignored Latin America when expanding TM's coverage across the world because there's loads of collaborators for whom it's not across an ocean! Plus Eurasiafrica is enough to be getting on with. Street names are hard to come by (no GMSV in Belize) even on multiple on-line maps, so some points are just the name of the community they lie in. There are a couple of VD errors for which there is no real place to put another point so they are False Positives in my view. Anyway, now that the wpt files are created, who/where should I send them? The 4 highways statement came from the tour guide. These may be the only fully paved routes but without GMSV it is hard to know. The 8 files I created come from looking at a map and deciding which roads made sense to include in a TM system. Future Belize travelers might suggest additional roads (though there aren't many more non-local short roads) and I would be happy to include them. Progresso Rd is an amalgam of 3 roads of which Progresso-xxxx Rd is the name of 2 of them. Not many google images out there to absolutely prove all are signed. 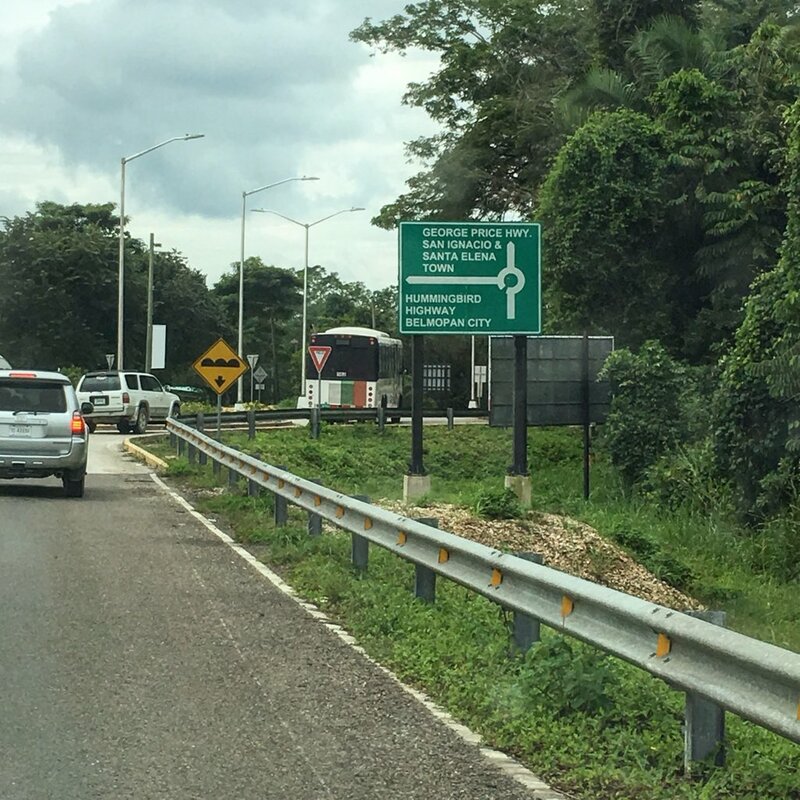 It does appear the Burrell Boom Cut is paved throughout and the Old Northern Hwy (leads to one of the top tourist stops in Belize - Altun Ha) appears to have been paved but may not be getting the fullest maintenance anymore. I am a highway engineer by profession and a fan of the Travel Mapping site. I also happen to be familiar with the road system in Belize. All of these primary roads are paved. 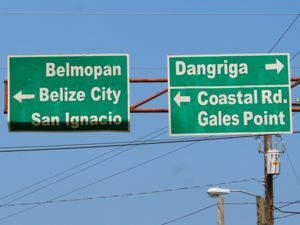 In Belize, the road numbers are not posted on guide signs. The road names are shown on guide signs at major intersections, but not typically marked in between. The primary roads listed above are mileposted, but there is not always a milepost in the field every mile. (And, yes, Belize is one of the few countries, in addition to the U.S., that uses miles rather than kilometers.) I definitely recommend including the primary roads listed above. The rest of the Manatee/Coastal Highway south to the Hummingbird Highway is not a primary highway. It is an unpaved road, parts of which may be impassable at some times of year. I recommend not including any of the Manatee/Coastal Highway. I do not recommend including the Old Northern Highway (does not serve through traffic anymore; poor pavement condition) or the Progresso Road to Corazal (does not serve through traffic; not sure of pavement condition). You commented that you had difficulty finding names for minor roads at intersections that you will be using as waypoints. If you send me the latitude and longitude for any intersection, I can probably give you either the name or number for the side road at that point. I couldn’t find street names for every point where you did not have them, but I found quite a few. In a couple of cases, I have suggested moving the waypoint to a nearby intersection for which I do have a name. So, for each highway, here’s your list annotated with new names where possible, followed by my take on what the waypoints for each road should be. The waypoints include every AR (national route) and D (district route) intersection. Except in one case (Benque Viejo del Carmen which is a key community), I have only included F (feeder road) or no-number road intersections where you had listed them. Waypoints are listed in the direction of increasing mileposts. Use my suggestions or not at your discretion. The road numbers I have given are how these roads are designated by the highway agency. The road numbers are NOT signed in the field. Two new devel systems are part of the site update in progress right now. Four routes in blzar and one in blzd. One note: it looks like some waypoint labels use BZE rather than BLZ at international borders. If the devel routes look good, I expect we'll put these systems to preview this weekend. I have changed in my files the BZE references in the 2 routes that reach a border. I will submit the updated files after receiving any other feedback on the 5 routes. Note for whoever does the peer review: there are some segments with no discernible roads within the 10 mile guideline; also in a few instances a community's name is the waypoint as there was no named road available. Road names were established/confirmed in dharwood's post from March 27. This system will be at preview with tonight's update. Belize looks great! I have one comment. For Route AR4, you listed the name of the road in the Highway Browser as Coastal Highway. It should be Southern Highway. Belize looks great! Route AR4 has been listed in the Highway Browser as Coastal Highway. This should be Southern Highway.